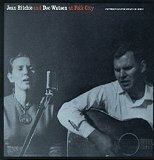 In the second segment of the series, we listen to a July 2007 interview with musical legends Doc Watson and Jean Ritchie. These two performers were important influences for the 1960’s folk revival, and to this day are among the most important keepers of traditional American folk music. In the second part of the hour, we return to an interview with jazz pianist and music historian Ted Gioia, whose book Delta Blues looks at the history of Mississippi blues music.